A KOTOBUKIYA Japanese import! Her beauty will shine on her own, or alongside previously released mutants in the Bishoujo line like Storm, Psylocke, and Rogue! 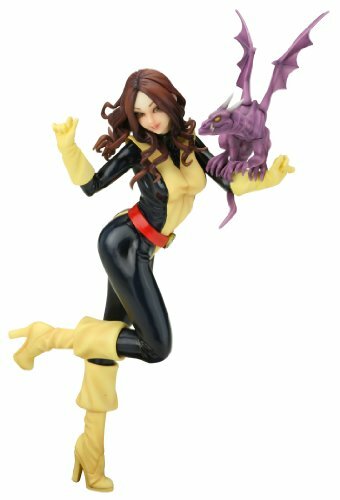 The Marvel Comics Bishoujo Statue line (capturing superheroines and villains inside the Japanese â € œ pretty girlâ € style) continues with a fan-favorite X-Men member whom fans have watched grow up over the years: KITTY PRYDE! 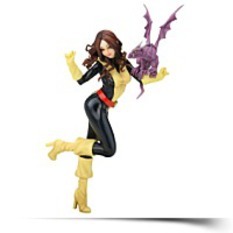 Sculpted by Mangusai Touda, Kitty Pryde stands slightly under 8 Â ½ inches tall, on a specially created display base, in the current Marvel Bishoujo Statue 1/7th scale. The young mutant is carefree as she frolics, one foot touching the ground and the other raised beneath her. Alternatively creating use of the codenames Sprite and Shadowcat she would grow to be a veteran member of the X-Men and right now teaches young mutants in the Jean Grey School for Higher Learning. Kitty turns in the waist to look at you, one hand held up by her face and the other outstretched to provide a perch for the diminutive dragon Lockheed. The X-Womanâ € TMs classic costume consists of a sleek bodysuit personalized utilizing a wide belt, lengthy flaring gloves, and retro cuffed platform shoes. Kitty now joins the ranks of other X-Women in the Marvel Comics Bishoujo Statue line based on a new illustration by Shunya Yamashita. Kitty has never looked cuter than she does now, caught in a playful jaunt with her best friend. Just a girl when she was approached by the mutant heroes in 1980â € TMs Uncanny X-Men #129, Kitty displayed the unique power to generate herself completely intangible, in addition to something else she wears, carries, or touches. Her active pose and the bouncing curls of her lengthy brown hair make this presentation dynamic, while Kittyâ € TMs beaming smile also as the unique appear of her friend Lockheed make her instantly recognizable. Dimensions: Height: 4" Length: 8.5" Depth: 4"
Package Dim. : Height: 5.5" Length: 10.9" Depth: 6.7"